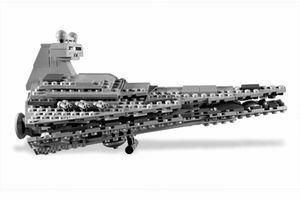 8099 Midi-Scale Imperial Star Destroyer is a LEGO Star Wars set released in August 2010 as part of Classic Star Wars. The set is on a similar scale to the other midi-scale set, the 7778 Midi-scale Millennium Falcon. So far, this is the second midi-scale released. This set is sold in the US as a Special Edition set at the LEGO Store and Wal-Mart. The ISD on its stand. The Midi-Scale Imperial Star Destroyer is equipped with a stand for display. This set is mainly composed of Dark Stone Grey and light grey pieces. The Imperial Star Destroyer is the first Imperial ship seen in the Original Trilogy of Star Wars. It pursures the Rebel Blockade Runner known as Tantive IV. The ship is seen in all three of episodes of the Original Trilogy in Star Wars. Recent sources, however, state that at least several ISDs - then known as Imperator-class Star Destroyers - were in the service of the Republic during the the Clone Wars. On an interesting note, Venator-class ships in Star Wars Episode III: Revenge of the Sith are shown in the final scenes with a gray color scheme identical to that of the ISD to symbolize Imperial transition. 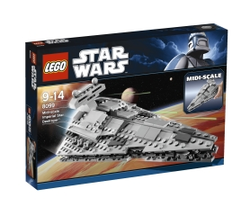 This set is the second Midi-Scale Edition set with the first being 7778 Midi-scale Millennium Falcon. All the Midi-Scale Edition sets are from the Original Trilogy. This is a description taken from LEGO.com. Please do not modify it. (visit this item's product page) The infamous Imperial Star Destroyer™- now in midi-scale! Appearing for the very first time in the opening scene of the first Star Wars™ movie, A New Hope,the Imperial Star Destroyer™ is the Empire’s most powerful warship and one of the most instantly recognizable in the entire series. This iconic ship now comes in midi-scale. Display the model using the convenient stand! Facts about "8099 Midi-Scale Imperial Star Destroyer"
The infamous Imperial Star Destroyer™- now in midi-scale!